Strangely, I feel like all the parts of my life have come together for this purpose – to protect Ihumātao. An area at the heart of Auckland, New Zealand, and currently the subject of a political land struggle. When I was nine years old I wrote my vision for inclusion in our schools’ time capsule which said I wanted to become a lawyer to make a difference. I worked hardto achieve that goal, and in the year I graduated and was preparing to go into a law practice, my whanau and I came across survey pegs on our ancestral whenua which we understood would become a public open space. During our investigations, we discovered a housing development was being proposed for the particular whenua block in contention. From that point on I put my law career on hold, decided to pursue justice for our whenua, and fulfill my responsibility as a kaitiaki to our ancestral landscape at Ihumātao. People would describe my upbringing as somewhat of a struggle, but it taught me how to be resilient, strong, and courageous. On reflection it makes a lot of sense given where my life is now, and unknowingly and unexpectedly becoming a spokesperson for the Save Our Unique Landscape (SOUL) campaign. SOUL was co-founded by my cousins and I to work towards the protection and preservation of ancestral, cultural and heritage landscapes at Ihumātao. 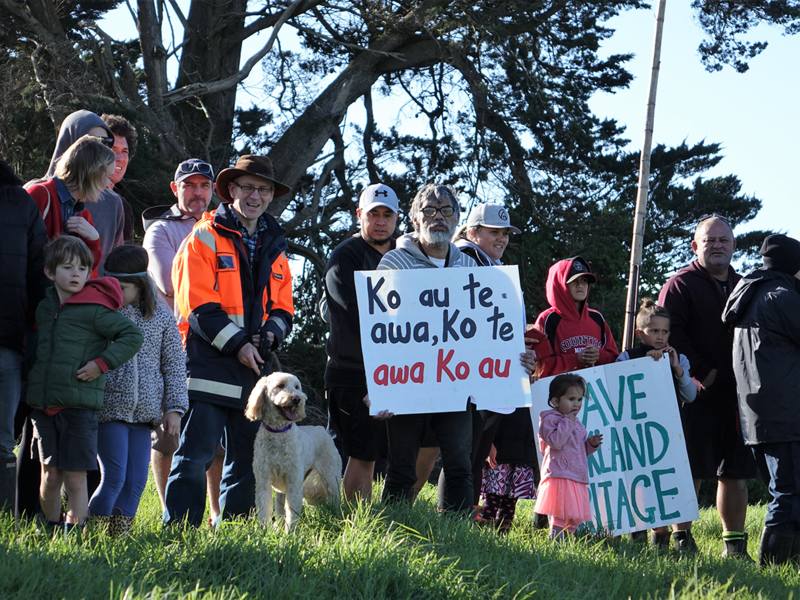 Nationally significant to our nations’ history, Ihumātao is home to the oldest continuously occupied Māori Village in Auckland, and arguably the oldest across the country. It was here gardens that fed the growing population of Auckland were intensively cultivated by Māori. Archaeologists argue that the Ihumātao area is internationally significant because Aotearoa was the end point of human migration from Africa, and here at Ihumātao the landscape speaks to the earliest human inhabitation. Dave Veart – a well-respected New Zealand archaeologist – describes this area as a thin place, where the veil separating time and space is transparent. Where the past, the present, the spiritual and the physical merge. A sacred place, a wāhi tapu. Dave will always make the point that he is a scientist and not supposed to feel like that. He has worked all around the world and he says Ihumātao is the only place he feels that thinness. That’s the sort of significance we’re talking about here. There were hundreds of hectares of land like this in Auckland, all destroyed in the last 40 years. Ihumātao is one of the only areas left with this kind of significance and this is why it needs protection. 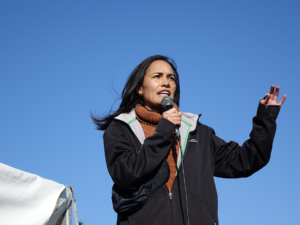 For me, Ihumātao is most valued because it is here that I possess my strongest sense of belonging, and deep rooted connections to our whenua, our ancestors, and to my culture – often termed turangawaewae for Māori. I feel this umbilical connection to the landscape, because the land, the mountains, the awa, and the moana sustain me spiritually, physically, mentally, and socially, which aligns with our holistic worldview – a Māori worldview. The narratives of this place are crafted through tangible remnants of stone, soil, and water. But the true beauty of this landscape lies with the intangible values that reach back beyond the written sources that historians, archaeologist’s, heritage practitioners, and lawmakers conventionally rely upon. They create deep spiritual connections – a sense of belonging that is represented through the stories, songs, and relationships people have with this place. The importance of these intangible values has been ignored time and time again in the heritage management of places of importance in NZ. This raises the question: do we know what’s important about our heritage in New Zealand? For me, I don’t think we do – well, it’s not balanced to say the least. Heritage New Zealand is the agency responsible for looking after our nation’s heritage, but when I look at the sites protected on its heritage list, I notice over 80% of these sites are colonial places and colonial built heritage, and only around 10% are specifically Māori heritage sites. I ask, why is this list so unbalanced? Are Māori heritage sites not important to our national heritage? If so, why isn’t greater emphasis being placed on protecting Māori sites? It seems to me that as a nation we value some forms of heritage more than others. But If heritage is not simply about protecting ‘the pretty things’, why are we having so much trouble listing and protecting those places and landscapes that are reminders to us of our pre-colonial legacies? A closer look at the evidence shows that there are over 600 churches and around 340 church buildings listed on the national register, compared to 183 places listed as wāhi tūpuna, wāhi tapu or wāhi tapu areas. If more than three quarters of the places on the list represent 150 years and less than a quarter represent over 700 years, what are we saying about our relationship to the past? How is this not a sign that the current list needs a rebalancing and a serious critical review? Why is the focus still on built heritage, which is so disproportionately about colonial history? To put this further into context, the cultural heritage landscape at Ihumātao was the subject of an appeal in the Environment Court because our national heritage agency approved an application to destroy heritage features at this place. Why? To make way for a million-dollar housing complex proposed by Fletchers. When preparing to lodge our appeal for Court against Heritage NZ, we uncovered that over 95% of applications to modify and destroy archaeological sites are granted. I asked myself, how well are we protecting what is important to us as a nation? Have we got the balance right, or is this another example of white space colonial structural racism? For example; we have the Auckland Civic Theatre – built in the 1920s for entertainment purposes, and we have Ihumātao where the earliest inhabitants of Aotearoa lived and thrived for hundreds of years. Demolition of the Civic Theatre building is prohibited, but this is not the case for Ihumātao, a result of Heritage NZ who approved the destruction of cultural and heritage sites significant to us as mana whenua, a city, and as a nation. The key to our national identity is an outcome of the investment we make in protecting our heritage. How is it that places like the civic theatre are more important to our national identity than ancestral landscapes such as Ihumātao? Why is colonial heritage given a higher threshold for preventing destruction? Consultation with a diversity of people with a connection to the land, rather than the self-serving limited group who support the development, has been a criticism we have taken to the UN and received support for. Last month marked two years since we began the occupation on the whenua at Ihumātao. A lot of my friends are out partying, extending their careers, having families, travelling, and doing lots of cool stuff, while I sacrifice many of those to attend meetings, and fulfil my obligations to the occupation. I don’t regret it because this cause is so important, not just for me, but for my nieces and nephews, our whanau – and for Auckland and Aotearoa. We have been challenged in ways I never imagined possible and I’ve stepped outside my comfort zone, but I know these challenges and other experiences will make me stronger and contribute to a better Aotearoa. Of the campaign, I’m constantly asked how far will I go? I reply cheekily that I would die for this land. People laugh, but I think back to Pete Bethunes’ wise words, “You haven’t lived until you’ve found a cause worth dying for”. I think I have found that cause and I’m prepared to die for it if I have to. Click here to sign the petition and support the SOUL Campaign.